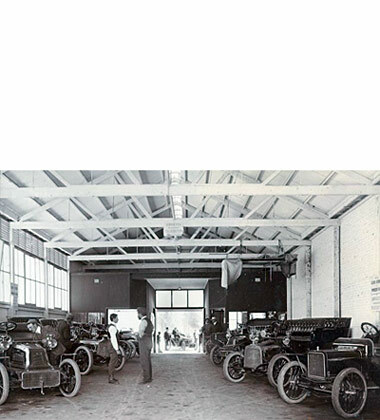 Mullins Wheels was founded in 1905. Since that time the Mullins wheel range has developed progressively in line with the automotive industry. 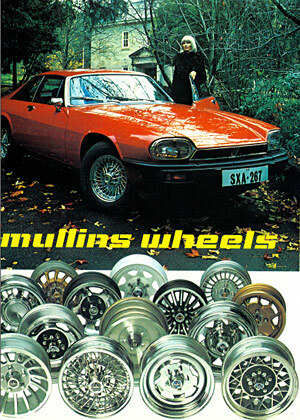 Mullins' current product range is extensive and Mullins Wheels are the market leader in Australia. In the late 1800's the first motor vehicles were fitted with wooden spoke wheels and narrow solid rubber or high pressure tyres. These wheels were found to have limitations when travelling over the rough, unmade, often sandy roads prevalent at the time. Merrington M. Mullins who founded Mullins Wheels, began his career at the Lewis Cycle & Engineering Works in Adelaide, working as a Wheelwright. 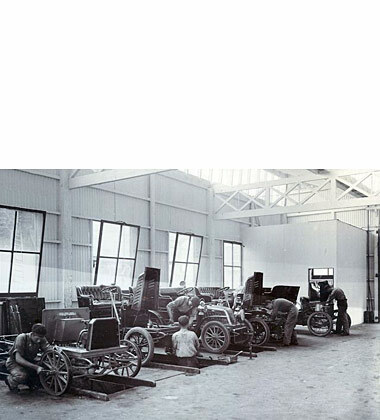 In 1897 whilst working for Lewis Cycle & Motor Works, Merrington M Mullins manufactured wire wheels for the first petrol driven motor car built in South Australia. 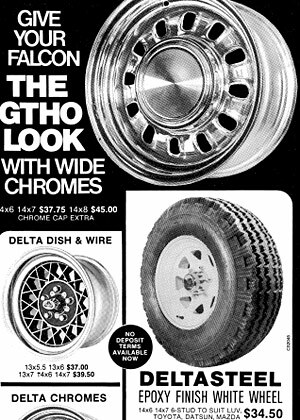 Falcon 12-Slot, GTHO look-a-like, steel chrome wheels and Delta brand Dish & Wire wheels starting at $37.00 each, were hot property in the early days of mag wheels. If you, your mate or your dad had a Falcon in this era, you just had to get a set of GT 12 slotters to make it go faster! Brand new Delta Triden Mags on a late night special for $125 for a set of 4. This seems like an unbelievable price! 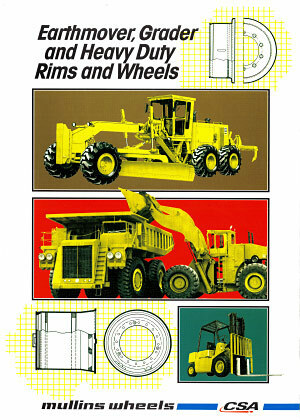 The same wheels today would cost approx $640 for a set of 4 in 14" size. All the tough guys with hot cars had a set of Triden mags in the mid 70's. 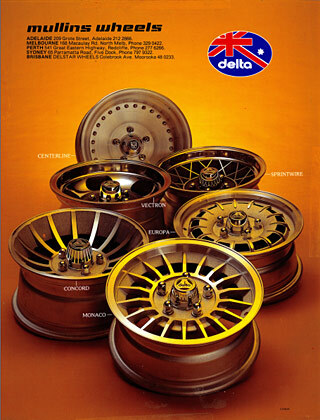 Delta Hotwire mags were available in 14x7", 14x9.25", 14x10", 15x7", 15x9.5" and 15x10" sizes. This old ad shows 13x5" Mags at $39.80 each and 14x6" Mags at $42.00 each. This was a great selling mag in its time and we still get asked for them today. Sorry but no they're not still available! 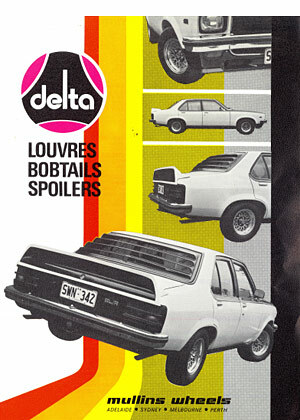 This ad featuring the popular SL/R Torana showed how Louvres, Bob Tails and Spoilers could make your stock SL/R Torana into a Bathurst ready race car. Car accessories were all the rage in the 70's when virtually nothing was fitted standard. Accessories complemented good looking Mullins mags. 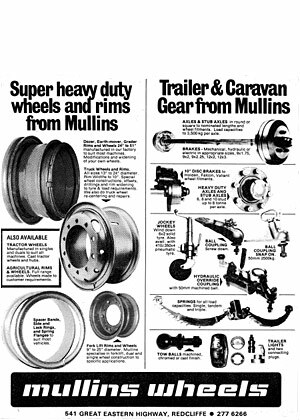 Since the mid 1920's Mullins have always been involved in the repair and replacement of heavy duty truck wheels & rims and axles, hubs, stubs and various trailer gear. This ad from 1981 is still relevant today although Mullins range has grown substantially. This advertisement for early Delta Mag Wheels looked fairly racey for its time. Big dish and big lips were cool back then and nothing seems to be different today. Buyers still want the same great features in a wheel today. Do you recognise any of these wheels from the past? Bathurst has always been a motorsport mecca. 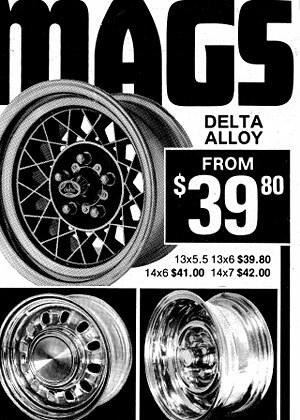 And mag wheel companies have always promoted their wheels in the official Bathurst race program. 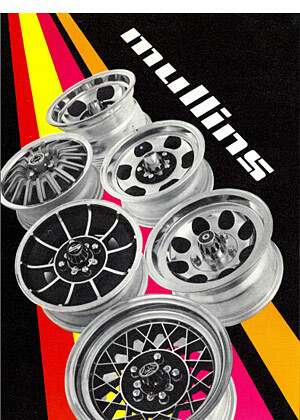 This is the Mullins Wheels advertisement as seen in the official 1981 Bathurst Race program. Nice looking wheels from almost 30 years ago. Centreline, Sprintwire, Vectron, Europa, Concord and Monaco. These Delta mag wheels were all steaming hot property at the time. This classy stylish advertisement from the past, still exudes today elements of quality, strength, visual appeal and most importantly, desire. 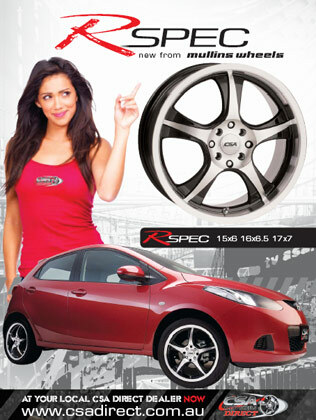 R-Spec is Mullins latest CSA alloy wheel which suits most small to medium front wheel drive cars. This new wheel and others in the Mullins front wheel drive range, is available in 15x6', 16x6.5" and 17x7" sizes to suit most popular small to medium cars. 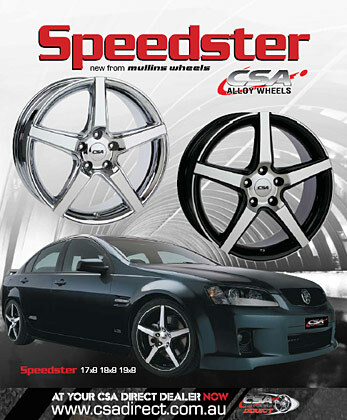 Speedster is Mullins latest CSA alloy wheel which fits Commodore, Falcon and various other medium to large passenger vehicles. Speedster is available in 17x8", 18x8" and 19x8" sizes. It has a high load carrying capacity and will fit over most large brake callipers. Check the link below for full fitment details. Mullins has always had a great range of quality 4x4 wheels and the same applies today with their latest range of popular 4x4 wheels to suit almost every on-road or off-road 4x2 or 4x4 vehicle application. Mullins CSA mags are made extra tough to handle the toughest Australian outback conditions. Mullins RoadKing forged alloy truck & trailer wheels deliver key qualities such as strength, durability, increased payload capacity and profit. They are fully forged lightweight and strong and have a brilliant machined or full polished finish. Suitable for both truck and trailer use. 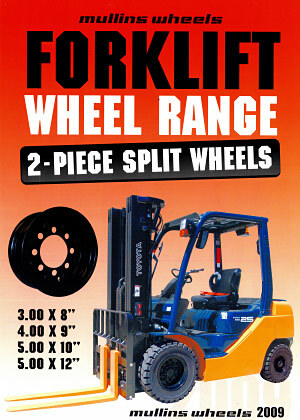 Mullins have a range of split two-piece forklift wheels which consists of 22 part numbers to suit all of the most popular forklift brands and models in Australia. Mullins also manufacture a range of heavy duty lock ring type forklift wheels to suit various heavy duty forklift applications. Mullins Wheels sells a comprehensive range of trailer components which includes all of the parts and accessories you will require to build a light to medium or heavy duty trailer. 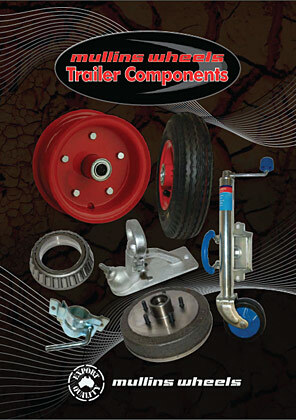 Mullins can also manufacture trailer axles and associated trailer component kits, to your own exact specifications. 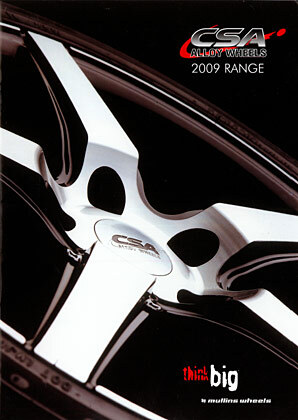 Mullins 2011-2012 CSA Alloy Wheels Catalogue. 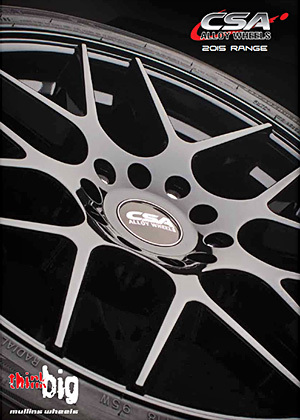 CSA's updated range of alloy wheels to suit small car, lare car, SUV's & 4x4 applications. 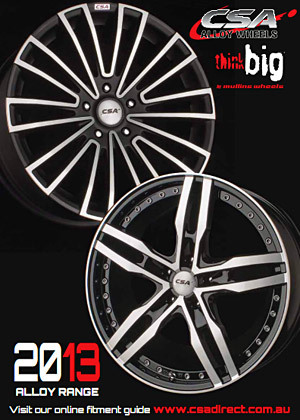 Mullins 2013 CSA Alloy Wheels Catalogue. 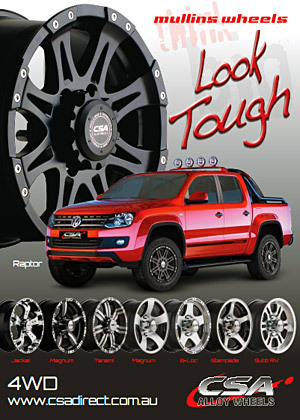 CSA's new style range of 2013 wheels to suit small car, large car, SUV's & 4x4 applications. 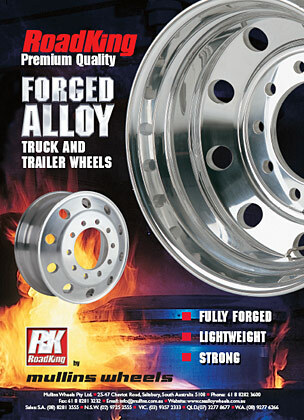 RoadKing 2014 Truck Wheels Catalogue. 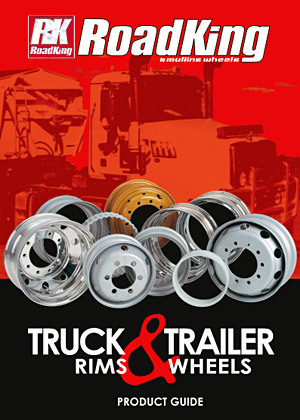 Mullins carries Australia's largest range of RoadKing steel demountable truck rims, steel disc truck wheels and forged alloy wheels. RoadKing is a premium market brand with a high quality reputation. Mullins are continually upgrading their RoadKing range to meet the demanding requirements of today's fleet operators and truck owners. 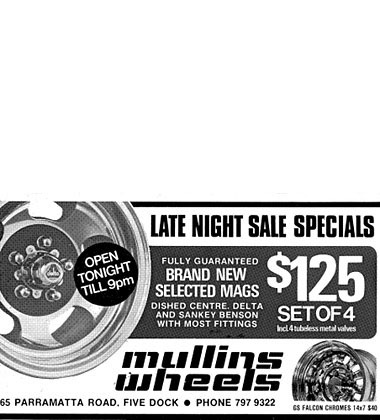 Mullins 2014 CSA Steel Wheels Catalogue. Mullins has a quality range of steel wheels to cater for 4x2, 4x4, SUV & trailer and industrial applications. The updated 2014 range includes white, black and galvanised finish wheels in sizes from 13" to 17" diameter. Mullins also sells a range of LT rated trailer tyres to suit their 13" - 15" steel wheels. In 2014 Mullins has enhanced their great range of quality 4x4 alloy wheels with the introduction of the new tough looking Raptor wheel in Satin Black finish. 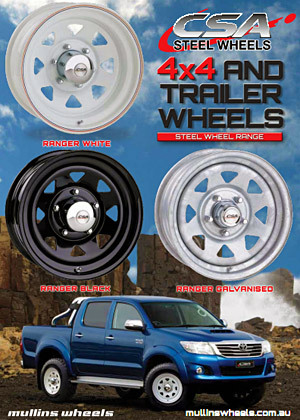 Mullins CSA have a great range of alloy wheels to suit almost every on-road / off-road 4x2 or 4x4 application. 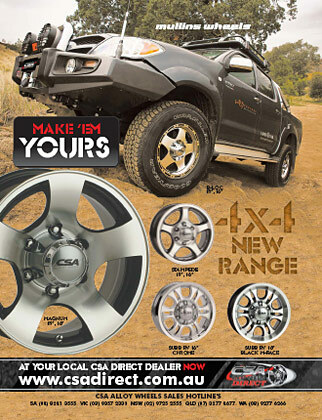 Mullins CSA 4x2 and 4x4 wheels are made extra tough to handle the rugged Australian outback conditions. Trust CSA off road alloys - Quality & reputation you can trust. 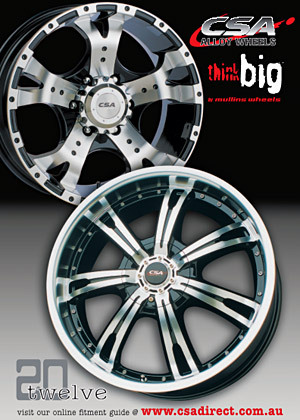 Mullins CSA Alloy Wheels Catalogue has a smorgasbord of great looking alloy wheel options to suit any vehicle. Whether you drive a small car, large car, SUV's or a 4x2 / 4x4 vehicle, Mullins has you covered. The new CSA Catalogue has some stunning vehicle & wheel photography so you can appreciate the look of our CSA wheels from multiple angles. You can also check which CSA wheels suit your vehicle on Mullins great new online vehicle fitment guide, Click Here.